The first thing to do is gather specific information about the automobile you are interested in. Appendix B in the ebook is provided for this task. Since there are many places to find used cars, trucks, vans and SUVs, each person handling the automobile has a different relationship with it. If you found the automobile in the classified ads, chances are it is a private seller. When you call ask if they are the owner or a dealer. While you are on the phone, try to get the Vehicle Identification Number. The VIN is located on top of the dash at the driver's side. You can locate it by looking through the windshield. You should also get the mileage along with the make, model, year, price and any options. With this information, you will be able to tell how the price of the automobile compares to the average selling price. (Step 8). If you find an automobile that interests on a dealer's lot and it passes a pre-check (Step 9), ask the dealer if they can give you the name and number of the previous owner. 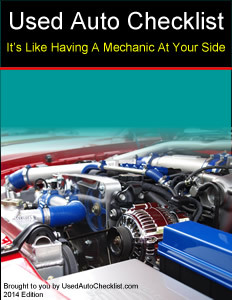 Also inform him or her that you will have the automobile inspected by a mechanic of your choice. If he doesn't agree to an independent inspection, walk away. Keep in mind, dealers know very little to nothing about the used automobiles they sell so it very helpful to talk to the previous owner. If you have gotten the previous owner's name and number, get the rest of the necessary information from the dealer (Appendix B in the ebook), then call the owner. You should go back to the dealer after completing steps 7 and 8. You should know the average selling price of that automobile (Step 8) and you might have some useful information from the previous owner.